1. Pre-heat the oven to 200°C, gas mark 6. 2. Lay the pastry sheets onto a floured work surface, and cut each sheet into 12 rectangles. Using a pastry brush, brush the edges of each rectangle with a little of the beaten egg, and lay a piece of sausage on each one. 3. 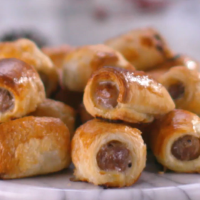 Roll and seal each sausage roll with a little more egg, and place on a baking sheet. Chill for around 30 minutes until they’re firmed up. 4. Remove from the fridge and prick the rolls with a fork. Brush the tops with the remaining egg. Bake for 25-30 minutes until golden brown. This recipe was first published in Wed Nov 16 15:51:26 GMT 2016.